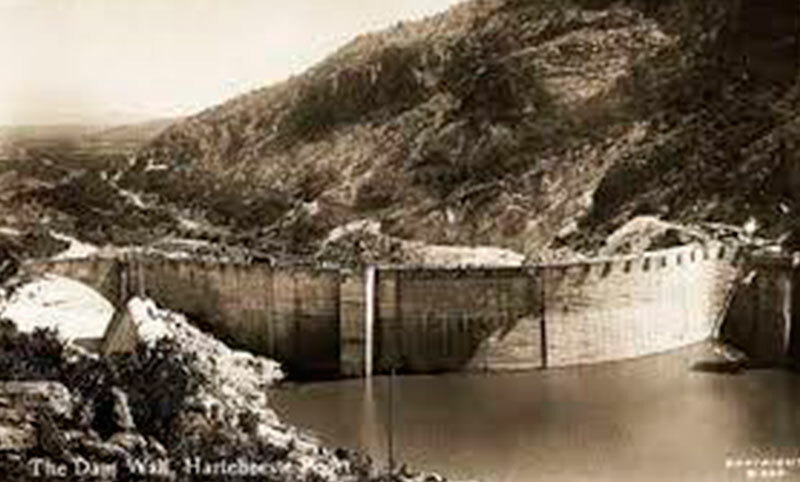 The greatest single event in the history of the neighbourhood was the building of the Hartbeespoort dam. It not only influenced the lives of people, gave rise to the establishment of towns, but also changed the whole landscape and to some extent even the climate and the vegetation. The change of landscape was so profound that the dam today is the most important element in the region, next to the mountains. For thousands of millions of years the rivers cut their way through the mountains. People of the Stone Ages lived in the natural hunting area for hundreds of thousands of years. For nine hundred years the Iron Age people utilized the clay, iron ore and flora for man and animal. And suddenly the white pioneers of 1836 “discovered” the potential of the water. Fountains, brooks and rivers were harnessed for household and agricultural purposes and for mechanical power for mills. Fords and bridges were constructed and the rivers became the focal point of attention. In those years already water was gathered from rivers and brooks and taken to the nearby fertile grounds by furrows. Sometimes small weirs were built in the streams and often retention dams were constructed in convenient positions to regulate the supply of water over dry periods. Thus in the Brits and De Kroon area there were seven big furrows and weirs in the Crocodile River alone before 1863. These irrigated about 2000 ha of riverside land. 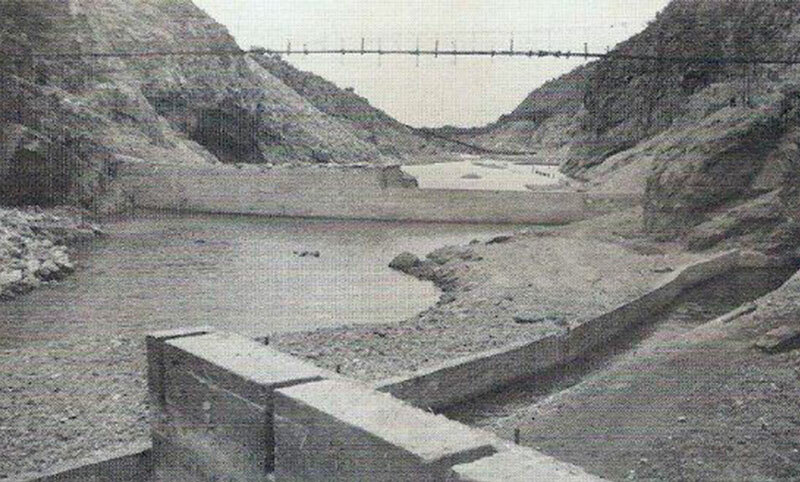 In 1898 Handrik Schoeman (later general) built the first “grand scale” dam of stone and cement and dammed the whole Crocodile River in the Witwaterspoort (048). This ambitious scheme, which he called the Sophiasdam after his wife, cost him a fortune of £10 000. It was calculated to provide water for a town, an industrial area and an intensive agricultural development of 8000 ha. He even worked out the turnout of the crops of wheat, tobacco etc that the scheme would yield. In those years it was the biggest dam in the southern hemisphere. 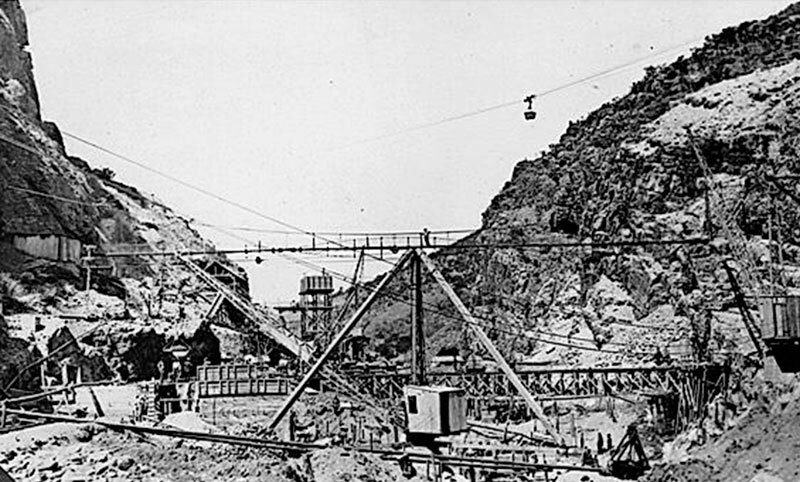 But Schoeman had counted his chicken before they were hatched: Unfortunately the engineer made a mistake in his calculations and the dam was washed away in a flood before Schoeman could sell the whole scheme to the Transvaal Government of Paul Kruger. Hendrik Schoeman’s son, Johan (044), in 1902 revived the idea in a more practical way by rebuilding the furrows fed by a smaller weir higher up in the river. With this he irrigated 3000 ha of land and turned it into a very successful farming enterprise. In 1905, August Karslon a Swedish engineer, suggested to the government to build a dam in the Hartebeespoort. From 1905 to 1910 the Department of Water Affairs of the Transvaal Colony did various investigations to test Karlson’s suggestion. 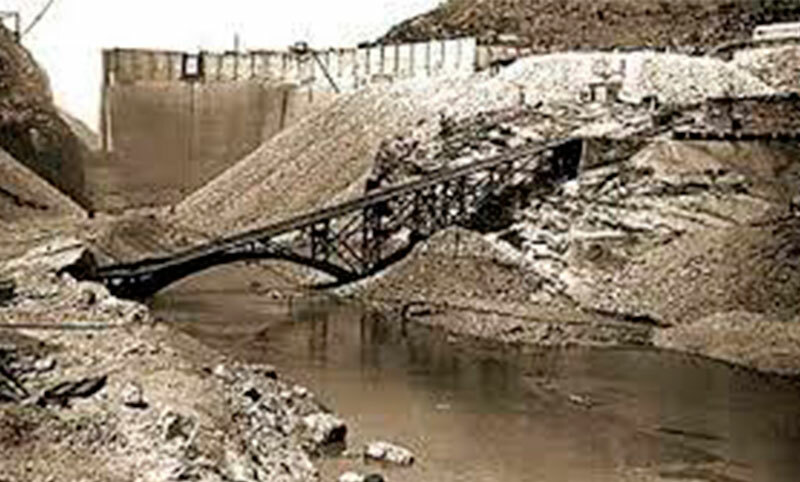 With the establishment of the Union of South Africa in 1910 the plans for building the dam were set aside because there were more urgent matters on the government’s agenda. However public interest placed so much pressure on the government that a law in 1914 was adopted which approved the scheme in principle. The Union government took part in the First World War (1914-1918) and again the dam scheme had to be set aside. After the war the country was poorer than ever, thus the immediate building of the dam could not take place. In 1918 progress was made at last. Ground was bought or expropriated, roads were diverted, engineers’ plans were compiled hastily and the whole logistics of material supply from the railway at Brits via coco pans to the Poort were planned and set into working. During that time, on public demand, the government also considered to use the dam project as an employment scheme for poor white people, of whom there were many because of the wars, droughts and diseases. Unfortunately not much happened until 1920 when eventually work was started in the Poort. But all of a sudden an unforeseen problem came up. The cofferdams, in other words the barrage which had to dam up the river temporarily so that the actual dam wall foundations could be poured, was washed away during the first flood in March 1921. The engineer left and almost everybody who worked on the dam gave up. After the flood the department employed a young and able enigeer, F.W. Scott, after whom Johan Schoeman, out of appreciation, named a street in his town Schoemansville. Scott immediately revised the plans and suggested to replace the enormous gravity wall (the same type of wall that was used at Sophiadam) with an arch wall, which would be supported against the rock faces on both sides of the Poort. Because the barrage was already placed in the far northern position in the Poort, Scott could not choose the ideal position for his arch wall. The compromise was thus a position where the western side support reached only half the height of the wall. The remaining support he got from broadening the wall on that side, and spanning the bridge that stretched over the spill way and using the weight of the “Victory Arch”. After Scott’s appointment everything went smoothly. 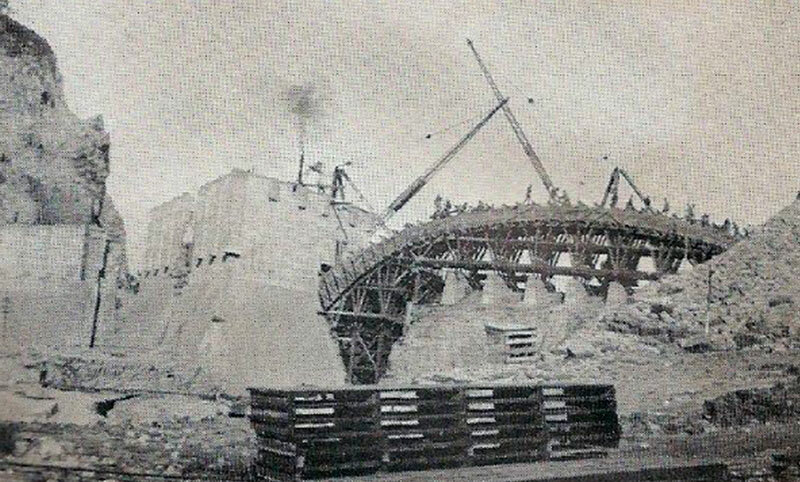 The cofferdams were reinforced in April 1921 and on 24 May the river was “tamed” so that concrete could be poured into the new foundations of the wall on 26 July. On 7 September the wall was already 2m high and in 1922 it could handle the floodwater. 1923 saw the completion and in September of that year a road over the wall, which was the new main road between Pretoria and Rustenburg, was opened. Lighting for the road, building a small hydro-electricity power station and the completion of the canals were the only outstanding items. White labour was again used for this and it was completed in 1930, costing more than the dam itself. The water is released at the bottom of the wall by two sluices from where it flows down the eastern and western canals. The eastern canal is 66km long and the western one is 58km. Each canal can handle 5,7 cumecs (5700 litre per second). The eastern canal runs along the rock face and contains a sluice from where the water can be released via a waterfall to feed the river and the “old furrows”. To build the dam, 250 000 bags of cement was needed which was supplied by Pretoria Portland Cement. The cement was transported by train to Brits where it was transferred to ox and mule powered coco pans, which transported it to the Poort. 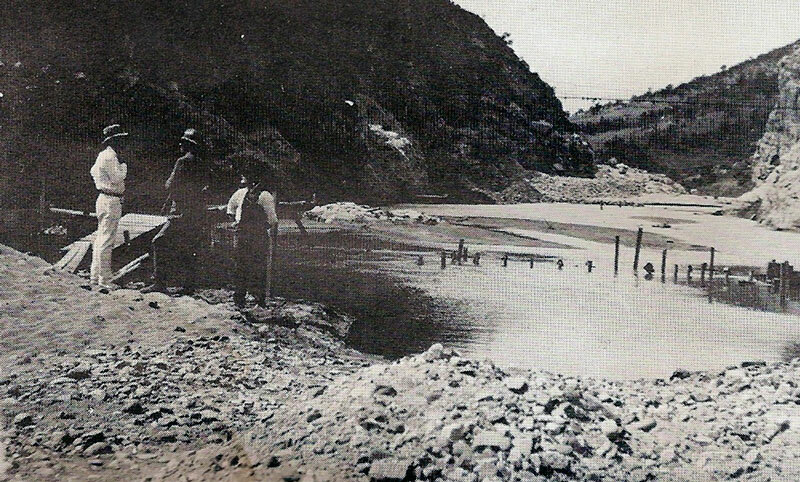 Crushed stone was extracted out of the eastern cliff face and sufficient sand was available in the river. Water for the concrete was not a problem but drinking water had to be transported from a fountain in the mountain. For this the workers built a pipeline for more than a kilometre on the mountain. They made the pipe out of empty jam tins, which they covered with concrete. Pieces of this pipe can still be seen today (091). When the dam is full to capacity the water runs over the concrete overflow. In 1970, 10 metal sluices (“crown sluices”) were placed on top of the overflow. Because of this the water level of the dam increased by 2,44m. The dam’s volume increased from 160 million cubic metres to 205 million cubic metres. The average daily water loss due to evaporation is approximately 165 000 cubic metre. The water of the dam is mainly used to irrigate 15 000 ha of agricultural land. Brits and Hartbeespoort use the water of the dam for industrial and household purposes. Through a system of canals in the lower river the Hartbeespoort dam can also feed the Vaalkop dam as well as the Roodekopjes dam. The office buildings and some of the better housing buildings which were used during the building of the dam were used in later years for the offices of Water Affairs, a post office, a telephone exchange and a household school. Most of the buildings still exist today and are used for one or other purpose (088, 089, 090). The so-called “Victory Arch” on the western side of the dam is something exceptional and not to be found anywhere else on a dam wall in South Africa. The motivation that it was built for structural purposes is somewhat unbelievable, if we take into account that the dam was already complete and full before the arch was started. Especially then, when the concrete did not reach its full strength yet, all other types of reinforcement were very important. The fact that the service of the architect Williamson and specialist in decorative concrete, John Barrow was called in indicates that the visual considerations were stronger than the structural. The arch is almost a copy of the common Roman victory arches with similarities to the Arc de Triomphe in Paris. The arch symbolises that the struggle for realisation of the dam, and the struggle against poverty was rewarded with victory. 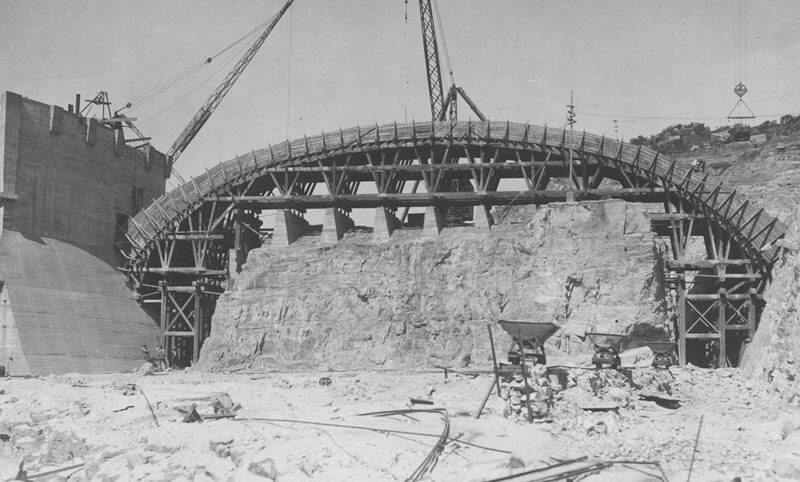 The arch is a repetition of the dam’s arch shape, which repeats the shape of the Union Building, which was completed just before the dam was built. On the eastern side of the arch an expression out of Varro’s “De re Rustica” (“The Rural Case”) is written in big Roman letters. It reads: : SINE AQUA ARIDA AC MISERA AGRI CULTURA (Without water agriculture is withered and wretched) Not a new piece of wisdom for any South African farmer! It is also very interesting that the expressions were written in Latin. The politicians of the day had a hard time trying to reconciliate the Afrikaans and English language groups. The use of Latin made it neutral. The arch is however unique to the Hartebeespoort dam.